Not only can Steve Hackett see the light at the end of his personal tunnel, but he confesses (as per his previous album) that he had made it Out Of The Tunnel’s Mouth. Two years and numerous concerts later things have changed a lot: He has married his life partner Jo Lehmann. Their love appears to be huge and strong, she has even become a permanent member of the songwriters’ cooperative that is keyboarder/co-producer Roger King and Steve Hackett himself. Gone, too, are the times of producing in the living room, for Hackett now has his own Map Studios to even record real drums again. Any musical changes? Not many, but that is not necessarily a negative thing with Hackett if you consider the high-quality product he has put out in the last couple of years. Those who take issue with his pleasure in mixing up styles will continue to have problems with his new album. Hackett simply cannot resist mixing up romantic folk, hard blues rock, minimalistic and bombastic music at his pleasure and garnish it all with exotic elements. The ingredients are, admittedly, things we already know from Hackett, and some may even wish he would experiment with other ingredients. Yet it is obvious that enough fans follow him on the path he has been going down for several years now. Hackett introduces the album opener with gloomy electric guitars and wistful string chords. The title was provided, of course, by the well-known Scottish lake whose waterside is as beautiful as the lake itself is deep and dark. Hackett switches between heavy stadium drums with a typical Hackett riff (which resembles Cell 151 a bit) and very acoustic-romantic verses. This brief instrumental could well be called Loch Lomond, part II, for it keeps up the speed, the drums remain mighty and the string chords sound like a big finale. Hackett fittingly makes his guitar sing again. A brief, dreamy intermezzo on classical guitar. The rock band must wait outside! Relaxed picking on the acoustic guitar, passionate string arrangements and Steve’s wistful vocals are all that is needed here. The dominant ingredient of this song, already performed in recent concerts, is Hackett’s majestic guitar line (which is reprised in the next song), which makes it comparable to songs like Sierra Quemada, although the difference lies the contrast provided in this song: A heavy bluesrock part in 7/8. Steve even breaks out his blues harp. A folk bit follows. The picking on the twelve-string guitar obviously reminds one of Hackett’s times in Genesis. Acoustic guitar and Steve’s vocals, alone or as a mini-choir with his brother John are quite enough to create a dreamy, romantic mood. A violin solo and string arrangements give the song a warm, gentle ending. A surprising song, not only because of its strong beat with lots of Far East percussions and the sitar, but also because the lead vocals are sung by Amanda Lehmann. The song offers very entertaining five minutes with various instrumental twists, solos and the playfulness of a soundtrack. The inconspicuous beginning does not indicate at all that what sounds like a train approaching from afar would turn into a mighty Phil Collins tom-tom beat. The bass note remains, the chords change and Hackett and the orchestra solo in keys that are sometimes quite from the Far East – a bit like The Steppes. If Genesis ever did a revival with Steve, this would have been a good song for the setlist. Who spots the brief citation of a Tony Banks solo? Another visit to the land of romance! The orchestra provides an almost timelessly schmaltzy introduction to the song that is based around classical guitar and Steve’s intimate vocals. A quiet band with Chris Squire on bass can be heard in the background. Steve sticks to the classical guitar for this catchy tune. It is all the instruments that are needed. This is a purebred bluesrocker! Simon Phillips hammers through a relaxed 6/8, Chris Squire thumps his Rickenbacher bass and Hackett sings and plays all out as a blues performer. Almost twelve minutes are allotted to this song. Accompanied by guest musicians Simon Phillips and Chris Squire, Hackett delves into his bag of tricks: Spooky orchestra, chopped staccato vocals, bombast parts, psychedelic guitar solos, riff rock in 7/4, collages from a film score, classical spinet playing the swing and many many more things. This is definitely the most demanding song on the album, perhaps even to the point of overtaxing the listener. One and a half minutes of stadium rock with anthemic lines on the electric guitar open up this mini suite, the songs of which are all inspired by one of the winds. Chris Squire plays bass again. Steve Hackett and Roger King let off steam on the classical guitar and the piano; from the basic form of this melancholy drifting sound they occasionally flee into improvisation. Greetings from Santana! 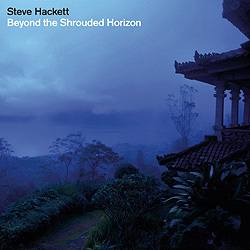 Relaxed Latino grooves on congas and broad Hammond organ are the basis for Hackett’s excursions on the electric guitar. This song has previously been released under the title of The Well At The World’s End as a bonus track for the Japanese edition of Darktown. 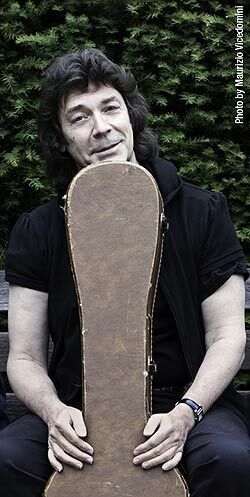 The last song of this four-pack belongs alone to Steve Hackett and his classical guitar. An entertaining three-minute piece in high spirits is quite up to comparable album tracks. The music continues straight away with this pure song that involves only the string ensemble. It was written by English composer and music critic Peter Warlock (1894-1930) who wrote this in 1926 as part of the Capriol Suite. The original arrangement called for two pianos, though later Warlock also arranged it for string ensembles and symphony orchestras. This instrumental, penned largely by Roger King, alternates between relaxed rock and fusion jazz. Surprise - an older number is recycled here. This song was known only instrumental versions under the titles Depth Charge (Time Lapse live, 1990) and Riding The Colossus (Genesis Revisited, 1996). New vocals/lyrics turn the new version into a catchy pop/rock song that would have fit well to GTR. The main theme of this instrumental track was released by the Dutch band Solution as the title track of their album Divergence. It became better known only through a new interpretation by Focus, who published it as part of their 23-minute epic Eruption on their second album Moving Waves. Hackett remains close to the version the band did with their then guitarist Jan Akkerman and offers relaxed fusion rock. This track was already included in the Japanese edition of Steve’s Wild Orchids album. Previously released as a bonus track on the Japanese edition of Wild Orchids, this is a new version of Steve’s classic Air-conditioned Nightmare from Cured (1981). It keeps close to the original, but it is improved by Gary Toole’s drums and a clearer, crisper sound. If you add it all up you will find: Steve Hackett remains true to his fashion of never following a fashion. As far as quality and sound and music are concerned, Beyond The Shrouded Horizon is a seamless successor to the rock records he has released in the last ten years. There are no really new influences, but again Hackett does everything to explore what is possible in the space between rock, blues, classical music and folklore. The crew, a seasoned team since To Watch The Storms, is occasionally augmented by one or two players. Some may consider this a lack of development, but it will calm those who appreciate what Hackett has released in the last decade. Disc two of the special edition adds new facets to the range of his works; the set has, incidentally, been given a very tasteful design: The minibook with the CDs contains many photos, the lyrics, comments and extensive credits.